Marc-Andre Fleury made surprise start to Game 1 of the Stanley Cup Playoffs against the Columbus Blue Jackets after Matt Murray was a late scratch. In an interview with NBC's Pierre McGuire, Penguins' head coach Mike Sullivan said Murray suffered a lower body injury during warmups. 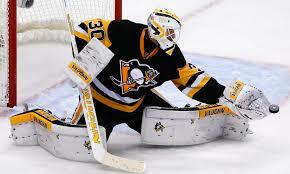 Sullivan announced that Murray would be the starting goaltender at Wednesday morning's skate. Murray left the warmup with roughly five minutes left and talked with athletic trainer Chris Stewart before leaving the ice. Tristan Jarry will be Fleury’s backup. He backed up Jeff Zatkoff in games 1 and 2 of last year's first-round playoff series against the New York Rangers. Further updates on Murray will be provided after the game.